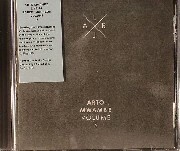 Girl, you know it’s Arto Mwambe! Indeed, it’s hard not to recognize this fact, even if you are a boy. “Live at Robert Johnson Vol. 6” comes straight from Arto Mwambe’s mind and out of their mixing desk guts. Instead of grabbing a bunch of records and gluing them together (i.e. the classic DJ mix CD), the dynamic duo that is melody boy Phillip Lauer and rhythm doctor Christian Beisswenger (Brontosaurus, Frankfurt am Main, untouchable Robert Johnson resident material and Ramona’s secret love interests) decided to do exactly that what sets them apart from most of their peers: to play live indeed (as in “live” and not as in pressing the space bar on a laptop). They simulated an hour in front of the club’s audience and went with it. And girl (or boy) you can hear this in very minute. The classic Roland drum machine sound aesthetic walks hand in hand with prominent bass lines, playful synthesizer sounds, sweet melodies, joyful piano finger exercises and even a hidden stripe of acid here and there. 06. "N No R G"